Not all business plans are the same; the type plan that is needed in start-up mode should be quite different than what would be used in a later stage. Early stage businesses should document milestones the team plans to accomplish, with mini-plans for describing how the milestones will be accomplished. Mature businesses have the luxury of using broader brush strokes to describe processes, personnel, and performance metrics. Regardless the stage, plans are required by lenders or investors to whet their appetites. When you think about it, this is really intuitive. Here’s why. 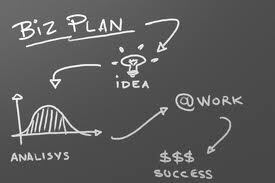 Business plans are read by investors and lenders for risk management reasons. These money sources realize they are taking a risk with every check they write, and want to mitigate this risk. The business plan explains to them how the business will use their funding, and paints a picture as to the likelihood that they will get an adequate return on investment. For mature businesses, the business plan is just one of severable variables the investor or lender can assess in their decision-making. For example, if you have a mature company, the investor or lender can speak to your customers, analyze your financial history, assess your team members’ backgrounds, compare your product to competitive offerings, and so on. As a result, if your business plan is weak but the other factors are really strong, your mature company may still receive funding. On the other hand, for a new company, particularly one that doesn’t yet have revenues, the quality of your business plan is critical; because it is one of very few variables that the investor or lender can review. The investor or lender can consider your business plan, the bios or you and your team, and maybe a product or service prototype if you have one. That’s pretty much it. It is up to you, through the power of your written words, to be winsome. Convincing. Persuasive. You are trying to demonstrate that what you are offering addresses a real problem with a viable solution that your organization can provide in a uniquely satisfying way. Succinctly discuss your process, document the metrics you plan to use to measure success, and share how your team has experience in performing the responsibilities required to execute the plan. Don’t use ambiguous phrases that make it sound like you are inexperienced. Overstating your hand, however, by using words like “most,” best,” etc will only undermine your credibility. Make sure you demonstrate your knowledge of the competitive environment and a winning strategy to secure target market share. Write about your customer profile and how your offering will be appealing. Discuss marketplace trends and how they impact the strategy you are pursuing. Finally, tell the reader how the money you seek will be used, when, and why.